Seville gives you the full Spanish experience: gypsies, horse-drawn carriages, ladies in lace mantillas, sherry, bullfighting, flamenco dancing, castanets at sunset. 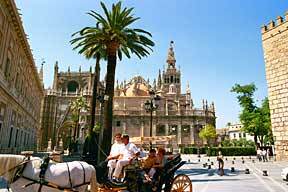 Seville is Spain with a flourish. Having been there before many years ago, I must confess I had an ulterior motive when I suggested to Bob that we go to Seville for a week. He had never liked Spain very much and said it was "all concrete skyscrapers and beach bums". The only reason he agreed to go was because I convinced him - correctly - that 'Sevilla', as is truly known, was really about what you traditionally expected of Spain and was much more interesting than the coastal regions he had visited before. Seville, I explained, was the real Spain. Perhaps that's not true, for it would be more accurate to say Seville is really what you would expect of Spain. Yet all the rest of Spain is quite happy that this should be so and might also admit that the Spanish coast is chiefly concrete and beach bums. Seville gives you the full Spanish experience: gypsies, horse-drawn carriages, ladies in lace mantillas, sherry, bullfighting, flamenco dancing, castanets at sunset. Seville is Spain with a flourish. It is a place of blossoms and scents. Don't bring a cold for a companion! It is situated in the beautiful Andalusia province, seemingly a million miles away from the concrete coast, with Andalusia being the capital of this very Moorish region and also worth a visit if you get the chance. It is a region that has been fought over by the Phoenicians, Carthaginians, Romans, Visigoths, Arabs, Vikings and the French, and the Moors were there for nearly 800 years, making a mark that time has not erased. It was high time Bob saw what they were all fighting over, for it was certainly not concrete! Christopher Columbus set off across the Atlantic from nearby and Seville once profited greatly from the rich Americas trade. But all good things come to an end, and Seville felt rather ostracized when they lost this monopoly, although it is still one of the most active river ports on the Iberian peninsula. While talking about history and tradition, you should know that this is still alive and well in Seville. Early Spring is the time to best appreciate this, and it all begins with the Semana Santa Holy Week. During this time, giant wooden figures representing the story of the Passion are carried high by Cofradia fraternities surrounded by the somewhat disconcerting aspect of what looks like a Klu Klux Klan convention: penitents dressed in white robes with high, white, pointed hats. The scent here is incense. But once this solemn time is over the city erupts into a week of celebration in which the penitents can legitimately refuel in celebrations of dancing, eating, drinking and equestrianism. These events are pure theatre, and the residents of this city well-rehearsed performers. There is a population of 700,000 to draw from! We caught the end of this week and it did bring more than one smile to Bob's pale face. When we came upon the streets devoted to bridal apparel he was quick to point out the exuberations obviously led to a lot of new matches. But he was hardly as keen to enjoy window-shopping this pre-nuptial spectacle as much as I did - everything from bridal gowns and shoes to elaborate wedding cakes and accessories - although he did seem to enjoy stopping to watch the many wedding parties we saw, often walking through the streets as if transport had not yet been invented - unless, of course, a horse-drawn carriage was in use. Everyone seemed to be infected with the romance and joy these happy parties seemed to exude. I believe even Bob was somewhat moved by it all - although he always did go a little weak at the knees in the presence of feminine beauty. The photographic sessions sought out the prettiest squares and trees and the result was a lovely balance between the natural beauty of the surroundings and the contrived beauty of the brides. One of the best places to watch all this in comfort is sitting in the Plaza del Triunfo adjacent to the cathedral where the orange trees make a perfect backdrop. The cathedral, one of the world's largest, seemed to have a somewhat cold interior. I much preferred smaller, more intimate churches such as the tiny Capilla de San Jose, just off Calle Sierpres, with all its ascending cherubs. The ceilings in the holy buildings of Seville put a permanent crick in both our necks, so pace yourself! This is also a good place to go if you are into Art, for there are many important works to be seen and local artists include painters such as Velázquez, Murillo and Valdés Leal and the sculptor Martínez Montañés. But Art, I find, is hard work. What I liked best was just strolling to see the real thing - or sitting at café tables to watch it all go tirelessly by. I liked the one-time Jewish Quarter of Santa Cruz best of all, and it seemed not to have changed a jot from my last visit. This is a place of secret courtyards and gardens, weeping blossoms and window grills. Bob was much impressed by a Moorish palace and the area's cobbled charm and bars - particularly the latter because of the endless stream of tapas (small dishes to go with drinks). Then there are the promenades where we liked to stroll in the evening alongside the River Guadalquivir with its heaving café culture. Bob and I found that tapas could often replace an evening meal; quite fortunate because it seemed hard to find a really good restaurant. There's plenty to do. If you must, there's bullfighting most Sunday evenings (April - October), but may I politely suggest you instead entertain yourselves by watching Flamenco dance and song since it comes from the Andalusian region. And yo must surely also experience the Andalusian cuisine. This differs from the rest of Spain because of the Arab influence, and spices such as paprika, cumin and saffron blend your experience with cured hams, sherry-bases sauces, olives and citrus fruit in the most delightful way. Time to confess my motive for bringing Bob to Seville. I had hoped that the endless romantic atmosphere - not to mention the streets full of wedding specialties - might make him take a romantic turn. Time we both got hitched again, thought I. Yet even lack of subtlety seemed to evade his comprehension down this particular street - which was truly well cobbled! It seemed my hopes would not be fulfilled. So I came back from Seville with bitter-sweet memories. 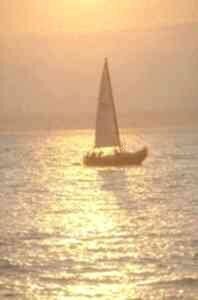 We did have a lovely time there, despite my broken dreams. I have to admit, that's all they really were. One of the last places we visited was the Plaza de Dona Elvira, which I think is perhaps the most beautiful square in Seville - despite its dark history. Apparently the daughter of a rich Jew, Susona, alerted her secret lover, a Christian nobleman, about a plot, involving her father, to take over the city. She feared her lover would be killed. As a result, all the conspirators, including her father, were executed... and so was Susona. Her last request was that her head be hung from the door of their love nest. To the best of my knowledge it has since been removed. So this story will stay with me as a reminder: not to lose my head in Seville!